Our kids love to build. They have big name building sets including LEGO, K’NEX, and Rector Sets, but some of their best structures come from random things laying around, as evidenced in this image on Instagram. The popular random item at our house right now and every year around Easter is plastic Easter eggs. 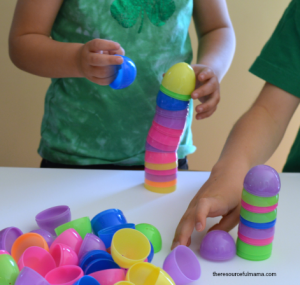 The kids love to play with these, so I decided to combine their love for these eggs and their love for building and created an egg towers STEM challenge. If you are not familiar with STEM, it’s an acronym for Science, Technology, Engineering and Math education. STEM is a curriculum based approach that combines the four in an integrated, applied approach. This egg towers STEM challenge takes almost no time to set up. I laid a out a pile of plastic Easter eggs halves and instructed the kids to start building. I challenged them to see who could build the tallest tower. They counted the plastic egg halves as they added them to their towers. We used egg count as our source of measurement. When they had built a few towers, we talked about the factors that contributed to the success of building the tallest tower; why big brother’s towers were always the tallest. 1. We talked about the eggs having a good foundation. They needed a flat surface to build their towers. 2. We talk about having a good design. They found if they built their towers straight from the beginning, they were more structurally sound and could be built taller. 3. We talked about support. The kids found that if they supported their towers with one hand while adding eggs with the other hand, they could make the tower taller. The middle child even tried his chin. Challenge the kids to make a pattern as they are building. Understanding patterns help children see how things fit together and predict what comes next. Pull out a ruler or tape measure to calculate height of the towers. Talk about the Leaning Tower of Pisa.